Is Speculation Really The Problem Now? Yesterday, Gregor Robertson called for a speculation tax to help bring down housing prices. 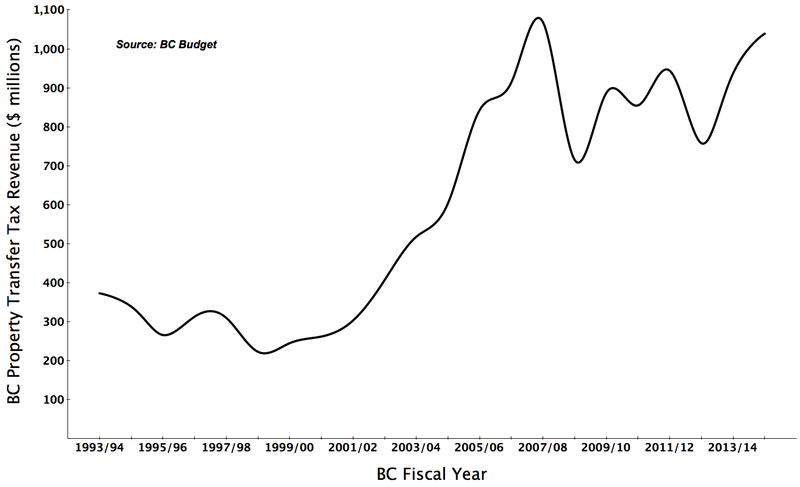 However, later in the day the BC Liberals repeated their apparent desire to keep housing prices from falling. As pointed out in Mystery Solved?, price increases over the last five or six years are being driven by the high-end. This is not indicative of a speculative market since very few people have the means to flip multimillion dollar homes. Tsur Somerville of UBC’s Centre for Urban Economics agrees. Instead, recent price gains are most likely coming from a massive inflow of offshore wealth into the region. And unlike the condo flipping of several years ago, these recent high-end buyers are looking for a safe place to park their wealth for the long term. They don’t appear to be speculating. The effect this flood of offshore wealth is having on the Vancouver real estate market is undeniable. The frustration of Vancouverites seems to be reaching a tipping point, and they are finally starting to demand action by their elected officials. But since speculation doesn’t appear to be the driving force in recent price gains, why is Robertson proposing this speculation tax now? Could it be just a diversion to take the heat off foreign capital inflows? A way to appear proactive, without actually solving the affordability problem? The Agricultural Land Reserve (ALR) was a good idea when it was introduced in the 1970s. Having lived in Los Angeles, I would never want to see that kind of urban sprawl here. But if too much land is off-limits to development, the ALR can needlessly increase the cost of housing to the point where it does more harm than good. After all, what’s more important, locally grown potatoes or an affordable home? And with all due respect to the Condo King, not everyone is ready to “give up the dream” and embrace the micro-suite lifestyle. Especially when we don’t have to. Have a look at this map created from the Agricultural Land Commission’s website. The ALR is in green. I don’t know what others think, but that looks pretty excessive to me. (The next time someone says we don’t have enough land because of the US border, show them this map). 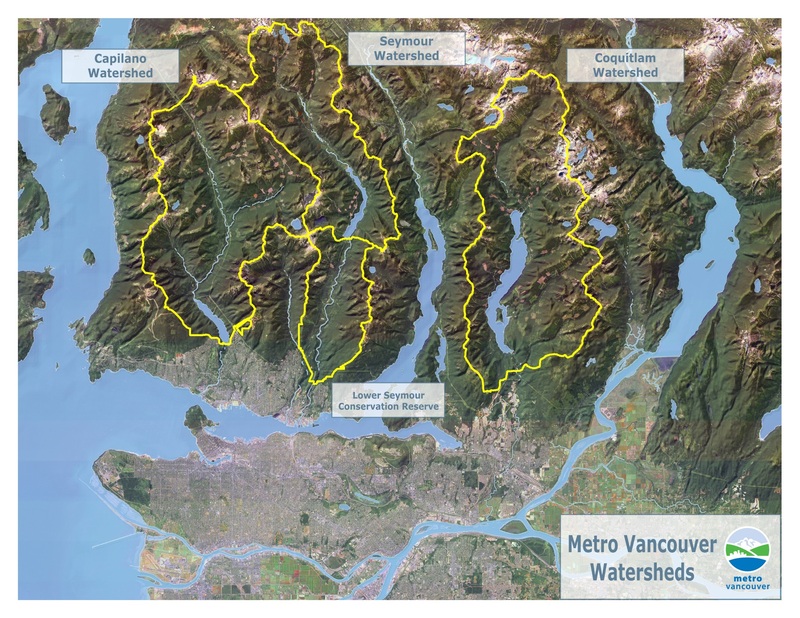 It also doesn’t help that we’ve restricted development in the North Shore mountains. With a few public works projects, we could easily satisfy our water needs using other reasonably close sources. If there’s anything this Province has enough of, it’s water! I’m not suggesting that we pave over paradise. But like with most things in life, there are trade-offs. Seems to me that if the cost of locally grown produce and locally sourced water is million dollar homes, it might be time to make some adjustments. How “World Class” Is Vancouver? One of the favourite justifications for high housing prices in Vancouver is, “we’re cheap compared to other world-class cities like Paris, Tokyo, London, New York, etc.”. In fact, Housing Minister Rich Coleman (following up on his comments from last week) gave this response a few days ago when asked about foreign ownership in Vancouver. But is Vancouver really comparable to those cities? How does Vancouver compare to those other cities when it comes to metropolitan area population? When it comes to population, Vancouver is not even close to the usual comparison cities. In fact, Tokyo, New York, London and Paris all have higher populations than Western Canada. On the list of North American Metropolitan Areas, Vancouver ranks 35th — right between Pittsburgh and Portland. The Globalization and World Cities Research Network has a methodology for ranking world cities. 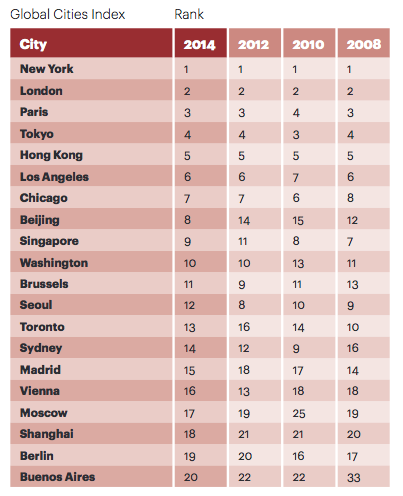 In their most recent analysis, the top four cities were: London, New York, Hong Kong and Paris. Vancouver ranks more than 60 places lower, most comparable to: Caracas, Riyadh, Chennai and Manchester. A.T. Kearney compiles a Global Cities Index (GCI), which “examines a comprehensive list of 84 cities on every continent, measuring how globally engaged they are across 26 metrics in five dimensions: business activity, human capital, information exchange, cultural experience, and political engagement”. The usual comparison cities are all at the top. Vancouver ranked 48th. The 3 most visited museums in the world are in Paris, New York and London. The Vancouver art gallery didn’t make the top 100. Of the four major cross-border North American sports leagues (MLB, NBA, NHL, MLS), Vancouver has 2 teams and 0 championships. New York has 8 teams and 41 championships. Vancouver briefly had an NBA franchise, but lost it to fellow world-class city Memphis, Tennessee. New York has Broadway, London has the West End, Vancouver has Granville Street? Vancouver is simply not in the same league as the truly world-class cities with which it is often compared. Two much more comparable cities are Portland and Seattle (similar populations, weather, natural beauty, etc.). So, how do these three cities compare when it comes to median house prices? Sure, Vancouver is cheaper than truly world-class cities. But compared to similar cities, it is extremely overpriced. According to Global Financial Integrity, about US$1.252 trillion in illicit financial outflows left Mainland China between 2003 and 2012. 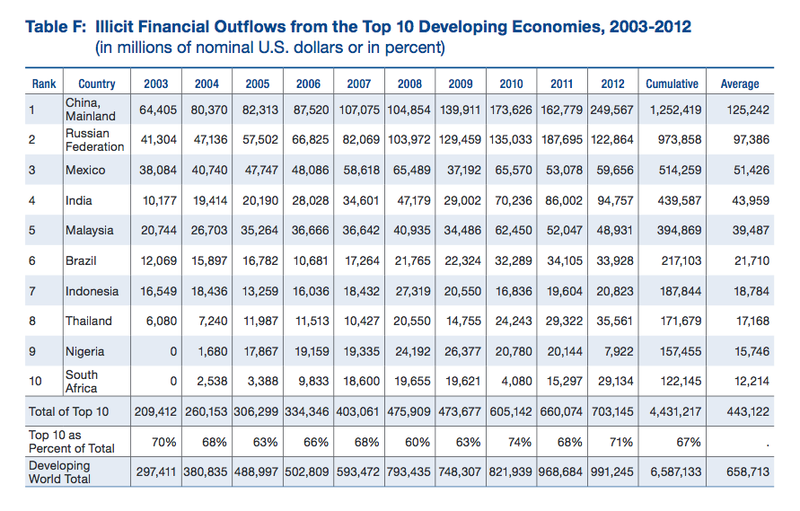 In 2012, the amount of money leaving China had increased to an astonishing quarter of a trillion US dollars!! How much of that money is making its way to Vancouver? According to China’s list of the top 100 international fugitives, 26 of them were most likely in Canada. And according to Ian Young’s analysis of immigration data, 80% of Chinese millionaire immigrants to Canada are planning to locate in BC — the vast majority of whom likely settle in the Greater Vancouver area. Using these figures, we can estimate the amount of hot money flows that could end up here. If we assume 26% of these financial outflows are destined for Canada, and 80% of those individuals locate in the Vancouver area, there was a potential flow of almost US$52 billion into the Vancouver area in 2012 alone! According to the REBGV, total sales volume for the Greater Vancouver region was $18.6 billion in 2012 — only about 36% of the potential hot money flow from China that year. Of course, not all laundered money ends up in real estate. But if only a small fraction of it does, that is more than enough to have a dramatic effect on local housing prices. BC Liberals, “Let Them Rent”! With all the recent attention this online petition to limit foreign buying in Vancouver has been getting, it’s elicited a few responses from the BC Liberals. Here is one from Rich Coleman. Foreign buyers have flocked to one of Vancouver’s most hotly anticipated housing developments, raising new questions about whether it’s time government intervened in the city’s increasingly unaffordable real estate market. B.C. Housing Minister Rich Coleman dismissed the idea of provincial intervention, however, arguing it would be unfair to people who have already invested in housing, including locals. “The real estate economy has been a free market economy for decades and people have made significant investments based on that,” Coleman said. And here is another from Christy Clark. Some fear such limits could stall the city’s real estate market, a sentiment shared by B.C. Premier Christy Clark. Foreign buying is driving up the price of housing. They don’t want to stop it because it will decrease the windfall being enjoyed by long-time homeowners. For all the lip service given to affordable housing, it’s clear from their actions that no level of government is interested in pursuing any policies which could actually make home ownership affordable to anyone who isn’t already on the gravy train. In other words, “Let them rent”.